A parliamentary report of 1777 recorded parish workhouses in operation at Chard (for up to 80 inmates), Chard Borough (50), Comb St Nicholas (40), Crewkerne (80), Ilminster (90), and Winsham (40). County of Somerset: Ashill, Broadway, Buckland St Mary, Chaffcombe, Chard (3), Chard Borough (2), Chillington, Combe St. Nicholas (2), Crewkerne (3), Cricket Malherbie, Cricket St. Thomas, Cudworth, Dinnington, Donyatt, Dowlish Wake, Hinton St. George, Ilminster (3), Ilton, Kingstone, Knowle St. Giles, Merriot (2), Seavington St Mary, Seavington St Michael, Shepton Beauchamp, Stocklinch Magdalen, Stocklinch Ottersey, Wayford, West Crewkerne, West Dowlish, Whitelackington, Whitestaunton, Winsham. Later Additions: Misterton (from 1896), West Crewkerne (from 1894). The population falling within the Union at the 1831 census had been 23,434 — with parishes ranging in size from from Cricket Malherbie (population 28) to Chard parish and borough (combined total of 5,141). The average annual poor-rate expenditure for the period 1833-35 had been £10,056 or 8s.7d. per head of the population. A new Chard Union workhouse was built in 1836-8 on Crewkerne Road in Chard. It was designed by George Wilkinson who was the architect of many other workhouses including one for the Wincanton Union. In 1836, the Poor Law Commissioners authorized an expenditure of £5,000 on construction of the building which was to accommodate 300 inmates. The site location and layout are shown on the 1903 map below. The two-storey building was a variation on the popular cruciform square design and somewhat similar to Wilkinson's design for the Devizes union workhouse in Wiltshire. 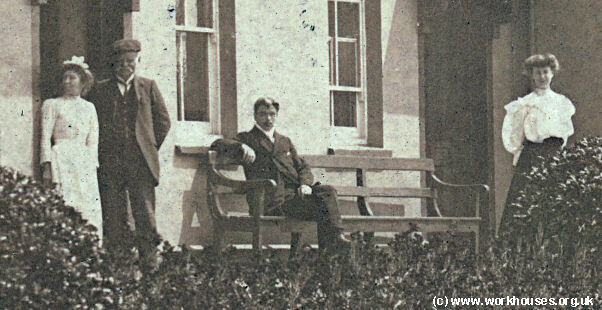 Chard workhouse from the north-west, c.1906. The inmates, thanks to the liberality of the Guardians and the kindness of Mr and Mrs Pallin, spent a very enjoyable time on Christmas Day and Boxing day. The pretty chapel was nicely decorated with holly and over the Communion-table was a cross of Christmas berries. On the walls were the words "Emmanuel, God with us". The inmates afterwards had cake and tea, which was much enjoyed. On Monday the usual festivities took place. The dining hall was elaborately decorated with evergreens, mottoes, gilded stars and Prince of Wales' plumes. ...The mottoes were of the usual; festive character but one, expressive of esteem, "Long Life to Mr and Mrs Pallin" showed the feeling entertained by the inmates towards those put over them. Dinner was served at two p.m. and consisted of prime roast beef, potatoes, baked and boiled, and each adult had a pint of beer. One ounce of tobacco was given to each man, snuff to the old ladies, and oranges and sweets to the children. After tea, which comprised cake and bread and butter, a capital magic lantern display was given and was thoroughly enjoyed by young and old. Then followed some ancient ditties, sung by the old people, and those who liked tripped it merrily. Songs were sung by the Master, Porter and several friends, and a very enjoyable evening came to an end. Cheers were given for those who had strived to make them happy. 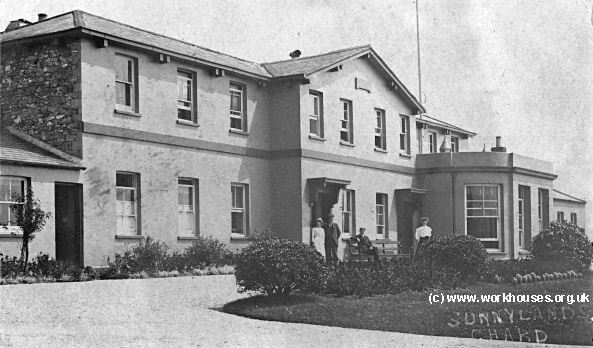 The former Chard Union workhouse, which became the Sunnylands elderly persons' home in 1948, was demolished in 1974 and the site redeveloped. 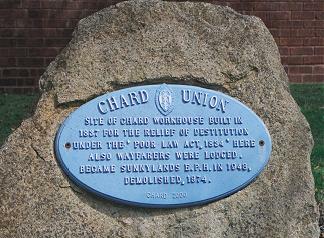 Chard workhouse commemorative plaque, 2000. Somerset Heritage Centre, Brunel Way, Langford Mead, Norton Fitzwarren, Taunton TA2 6SF. Holdings include: Guardians' minute books (1836-1930); Admissions and discharges (1891-1929); Births and deaths (1848-1914); Creed register (1913-30); Offences and punishment book (1862-98); etc.